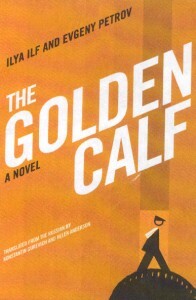 Rereading THE GOLDEN CALF by Ilya Ilf and Evgeny Petrov was like running into an old girl friend and falling in love all over again. I first heard about the book, a comic novel about a Russian con man named Ostap Bender and his raffish band of disciples, back in the 1950s when I was living in Greenwich Village near a small used bookstore owned by a man named Bernard Guerdon. It turned out that Bernard had translated one of the first English-language versions of THE GOLDEN CALF. I bought a copy from him and, on first reading, understood immediately why he had recommended it so fulsomely. The book's humor and irreverence touched me in a deeply pleasing way. I used to read the book every couple of years, until I left New York and lost my copy while in transit. Now Open Letter, the book division of the University of Rochester, has published a brand-new translation (by Konstantin Gurevich and Helen Anderson) of THE GOLDEN CALF. Based on the uncensored 1931 original, it restores sections that weren't included in the first version I read, including a witty introduction by the authors in which they defend their right to satirize the early, wide-open days of the Soviet Union. Basically, THE GOLDEN CALF is an attack on the collectivist, authoritarian mentality of the communist state. Ostap is a roguish individualist who finds the building of socialism boring. His goal is to escape to Rio de Janeiro and lie on a beach for the rest of his life, sipping tall drinks and dancing the samba with near-naked women. To do it, he must find an infamous millionaire named Alexander Koreiko and bilk him out of every ruble he owns. Aiding him in this crusade are a cross-section of equally greedy, disaffected hustlers and petty criminals.